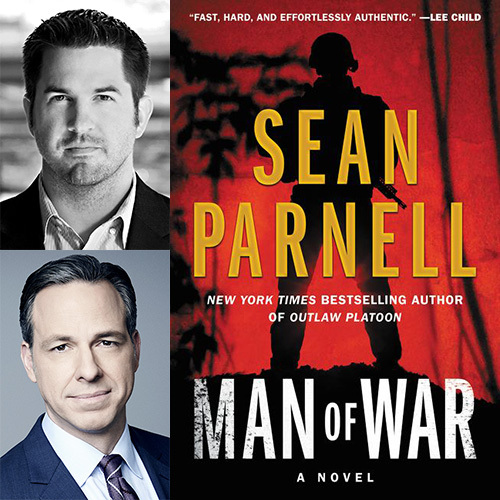 NPC Headliners Book Event - Sean Parnell: "Man of War"
Author Sean Parnell will discuss his debut novel Man of War with CNN anchor Jake Tapper and National Press Club President Andrea Edney at a NPC Headliners Book Rap on Thursday, September 13 at 6:30 p.m. in the Club's conference rooms. As a U.S. Army Ranger, Parnell commanded an elite infantry platoon known as the Outlaws, tasked with rooting out insurgents from a valley along Afghanistan's eastern frontier. His nonfiction account, entitled Outlaw Platoon, became a best-seller and “required reading” for young cadets across the country. Now Parnell brings his real-world experience and storytelling skills to fiction with Man of War. The novel introduces Parnell's character Eric Steele, an elite clandestine operative assigned to a U.S. intelligence unit known simply as "The Program." This event will feature a discussion with the author, an audience question-and-answer session, and a book signing. Tickets are $5 for National Press Club members and $10 for the general public. When purchasing tickets for this event online, buyers will also have the option of purchasing copies of the book at check-out. Books will also be available for purchase at the event. Proceeds from book sales will benefit the non-profit affiliate of the Club, the National Press Club Journalism Institute, so we kindly ask that you leave all outside books and memorabilia at home. Sean Parnell is a former U.S. Army Infantry officer and ranger who served in the 10th Mountain Division for six years. He retired from service as a highly decorated Captain, receiving 2 Bronze Stars (one for valor), and the Purple Heart. His memoir, “Outlaw Platoon: Heroes, Renegades, Infidels, and the Brotherhood of War in Afghanistan,” became a New York Times Bestseller. Parnell is the CEO of Branding Freedom, a marketing company, and co-founder of a charity called The American Warrior Initiative. NPC Members: There is a member promotion available for this event or you need to log in to register. Click here to log in and get the code.